Continuing its unwavering commitment to giving back to charities that change lives, The Ritz-Carlton, Laguna Niguel is pleased to announce that through the net proceeds from the 2017 Yappy Hour season and the support of several major donors, more than $83,500 has been donated to The Veterans Initiative of Canine Companions for Independence. Canine Companions recognizes the urgent and growing need for programs that provide support to veterans with disabilities. Many of the brave men and women returning home from combat with disabling injuries experience a litany of new challenges. Often, they face difficult transitions back to civilian life as well as uncertain futures with new disabilities. Canine Companions assistance dogs can help veterans regain independence, pride and hope. Beyond much-needed physical assistance, the love, loyalty and positivity of a canine partner can make a profound, lasting impact on someone dealing with difficult emotions that are hard to communicate. To date, Canine Companions has served 257 veterans, with 37 active teams from the Southwest Region. Headquartered in Santa Rosa, California, Canine Companions for Independence is the largest non-profit provider of assistance dogs and is recognized worldwide for the excellence of its dogs and the quality and longevity of the matches it makes between dogs and people. 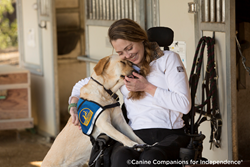 Canine Companions has been enhancing the lives of people with disabilities with its four types of assistance dogs that master more than 40 specialized commands: service dogs, skilled companions, hearing dogs and facility dogs.